McAfee which was acquired by chip maker Intel and try to re-brand it as Intel Security. But recently McAfee again start working as independent company under the brand McAfee after Intel sold it to TPG capital, Still Intel hold the 49% equity in the venture. So we are seeing some major changes to the McAfee products line this year. As we are seeing that McAfee is offering only its top notch products McAfee Total protection and McAfee LiveSafe on its official website and we didn’t found other products like McAfee Antivirus, Internet Security, Family Protection etc. Because we didn’t found officially, So we supposed that these products has been discontinued by the McAfee. If this is true then McAfee is the second company after Norton doing so. Norton had also discontinued all its products and start just providing a single Norton security product for all users. McAfee is now offering only the Total Protection and Live Safe products instead of lots of other confusing products. As per my thinking it is true that antivirus only products are of no use these days and every company should have to follow this practice. It clears the confusion between users while they go to buy a security product. So now we can say that McAfee will give a tough competition in 2018 to the Norton Security. The new McAfee 2018 antivirus software for 2018 has undergone a makeover and now has a new interface to coordinate its original name. It comes with many new features and give you the ability to license any number of devices you own. 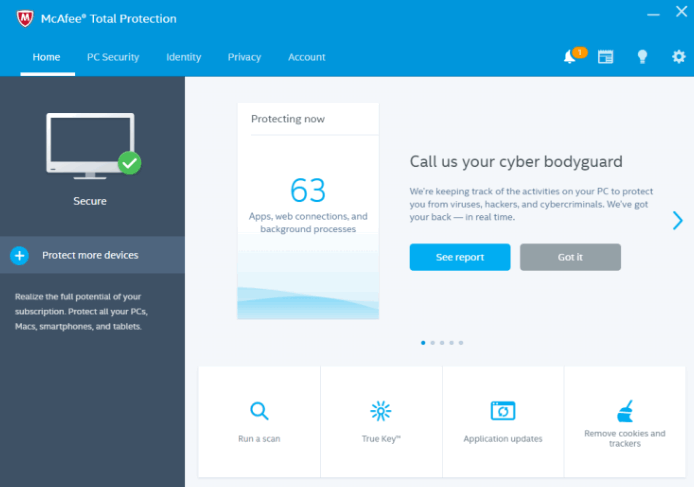 The new interface used in McAfee 2018 Antivirus streamlines the fantastic tools used to give your computer full Internet protection. The McAfee 2018 software is easy to use and has clear explanations of all the features. It has been manufactured eight times faster than the previous version. That means that it requires less memory, which means that your computer will run more quickly than it would have done when using earlier versions. Confusing terms have been changed, and some of the features have been changed to give it more power. Single license compatible with Windows 10, Mac OS, Android and iOS. Single license give you to protect unlimited devices in your household. Improved antivirus and antispyware protection that helps detect, block and eliminate different types of malware. Enhanced anti-phishing highlighted that warns you not to provide personal information from unsolicited websites. Fast bi-directional firewall protection to ensure inbound and outbound activity from your computer. Broad classifications of websites to warn you against to access insecure websites. Specific Stealth mode to hide your computer from unwanted intruders. Sharp Shredder to remove confidential information from the PC.